In contrast to the six recent outbreaks of HPAI H5 in France (see French MOA: Three New HPAI Avian Flu Outbreaks Reported), Germany has announced their most recent bird flu outbreak (see yesterday’s Suspected Avian Flu Outbreak In Bavaria) to be a low pathogenic strain. There are two broad categories of avian influenza; LPAI (Low Pathogenic Avian Influenza) and HPAI (Highly Pathogenic Avian Influenza). LPAI viruses are quite common in wild birds, cause little illness, and only rarely death. They are not considered to be a serious health to public health. 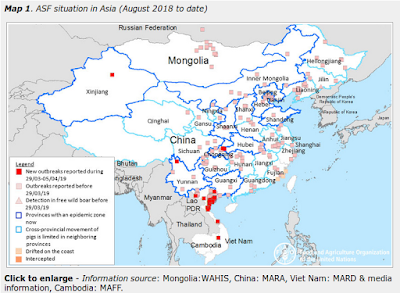 The concern is (particularly with H5 & H7 strains) that LPAI viruses (particularly in crowded poultry operations) have the potential to mutate into HPAI strains. HPAI viruses are more dangerous, can produce high morbidity and mortality in wild birds and poultry, and can sometimes infect humans with serious result. The type of bird flu scientists have been watching closely for the past decade has been HPAI H5N1 (and to a lesser extent HPAI H7s & H9s). While considered a rare occurrence, we’ve seen several instances in Europe over the past six months where a low path virus mutated into a high path virus (see ECDC: Situation Overview Of Emergent H5N1 & H5N2 In France). This statement from the Landkreis (District of) Cham. The laboratory tests have shown that it is the deficiencies found in the poultry operation pathogens is low pathogenic variant of the influenza of subtype H5N2 pathogen. In this variant of bird flu there is always the risk of progression to a highly infectious disease of birds. That is why also the culling of livestock was carried out on the affected poultry farm, which will be completed in the course of today, Monday. After completion of the action are to extensive cleaning and disinfection operations. In order to protect all commercial and private poultry farms, it is now sufficient, in a radius of at least 1000 meters of the affected property to set up a restricted area. The exclusion zone of 3 km and the observation zone 10 km are thus not necessary. In this restricted area, which is effective immediately, official veterinarians in the poultry holdings to collect data locally, clinical investigations and take samples for virological laboratory investigations. In addition, restrictions still apply to the poultry holdings in the restricted zone. There kept poultry and products derived from those products may not leave the respective location of the livestock. For poultry farmers special hygiene requirements apply (disinfection, protective clothing) in the care of their animals and the obligation striking findings in the poultry flock immediately to the Veterinary Office in the District Office Cham display. As far as poultry farmers in this area of their obligation to notify the Veterinary Office at the District Office Cham have not yet fulfilled, is requested , this shall be made ​​immediately at the telephone number 09971 / 78-224. statements about the future development can be taken in the restricted zone only after completion of the investigation. The District Office has again indicated that of the pathogen found not pose a significant hazard for humans. When handling poultry meat and eggs compliance anyway recommended hygiene measures for poultry products are sufficient.